Politics has always been one controversial topic especially come election time. Various projects are sudednly put into place, promises are made and various adverts are being paid for by friends and supporters. While the setting might be different, "The Campaign" is the perfect film to encapsulate the lunacy, insanity and hilarity that comes once every three years in our country. 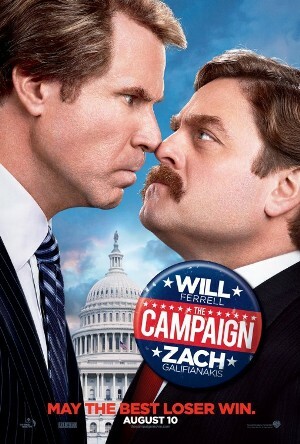 And even though the plot and story of "The Campaign" lacks some character and depth, the in-your-face and vulgar humor is a totally different beast. When long-term congressman Cam Brady (Will Ferrell) commits a major public gaffe, a pair of ultra-wealthy CEOs plot to put up a rival candidate and gain influence over their district. Their man is naïve Marty Huggins (Zach Galifianakis), director of the local Tourism Center. At first, Marty appears to be the unlikeliest possible choice but with the help of his new benefactors, a cutthroat campaign manager and his family’s political connections, he soon becomes a contender who gives Cam a run for his seat. As election day draws closer, the two are locked in a dead heat and this is where all hell breaks lose as both are hell bent to do anything and everything to win the congressional seat. What "The Campaign" lacks in plot depth it more than makes up with the perfect pairing of its two leads and the non-stop hilarious comedy that ensues from start to finish. But here's the thing, if you thought this would be a realistic political satire, then you would be left off disappointed. Also, don't expect no twists or turns as this is more or less a straightforward plot. What we do get is an obvious mix of what happens in real-life and some huge doses of over-the-top situations that wouldn't and couldn't happen for real. It's actually one of the staples of Ferrell's (even Galifianakis actually) comedic style in films and it works flawlessly this time around. It is this extreme style that captures your attention. Even the voter's stupidity are put into light as they are being swayed by ads, speeches, scandals and what-not. "The Campaign" may not make you bat an eye with regards to voting wisely but it does bring forth and zooms in the weirdness that happens every time the populace votes.